Slow cooker red beans and rice is so full of Cajun flavor and so easy to prepare! We make this recipe at least once a month. The whole family loves this stuff. Eight ingredients, chopped, dumped and cooked for hours. This is perfect to start in the morning before work or a busy day and just forget it until dinner. How easy is that? Who doesn’t need an easy slow cooker recipe every now and then? Cook for 7 hours and serve with rice. I prefer the taste and texture of andouille sausage but you could use smoked sausage if you like. 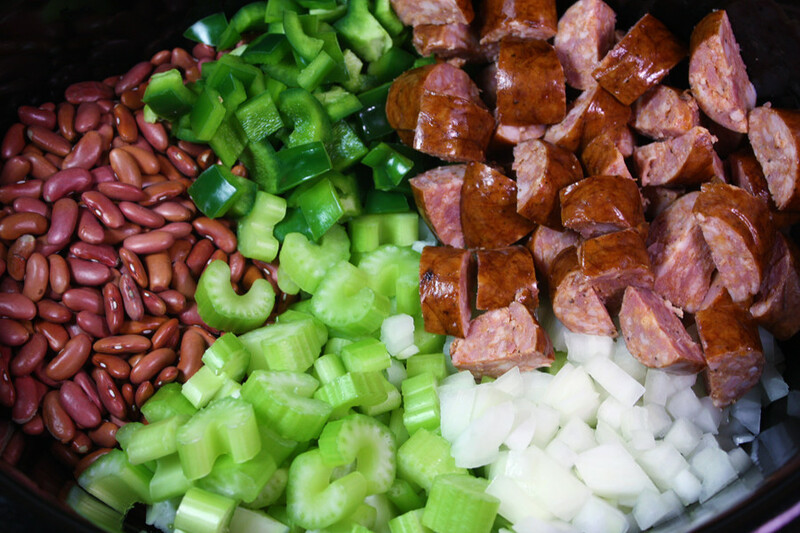 Slow Cooker Red Beans & Rice - Dinner almost prepares its self with this recipe. Full of Cajun flavor! Rinse beans thoroughly and put into crock pot. Add vegetables, sausage, creole seasoning and water to the beans. Cook on high for about 7 hours. When ready to serve, cook rice according to the package. 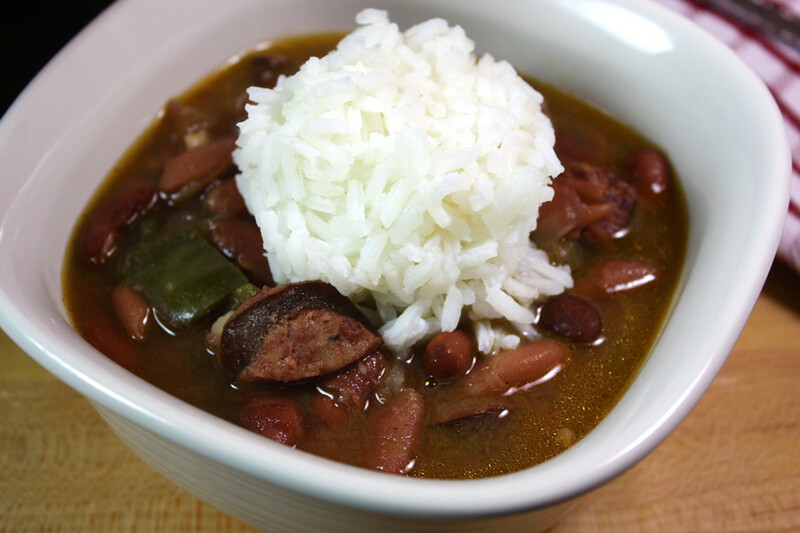 Place the desired amount of red beans in the bowl, top with rice and serve. That looks yummy! Your pictures are beautiful!! I pinned this to save, thanks! Looks like a yummy recipe! Thanks for sharing at the Inspiration Spotlight party. Pinned shared. Have a great weekend! What a great dish for a cold day. 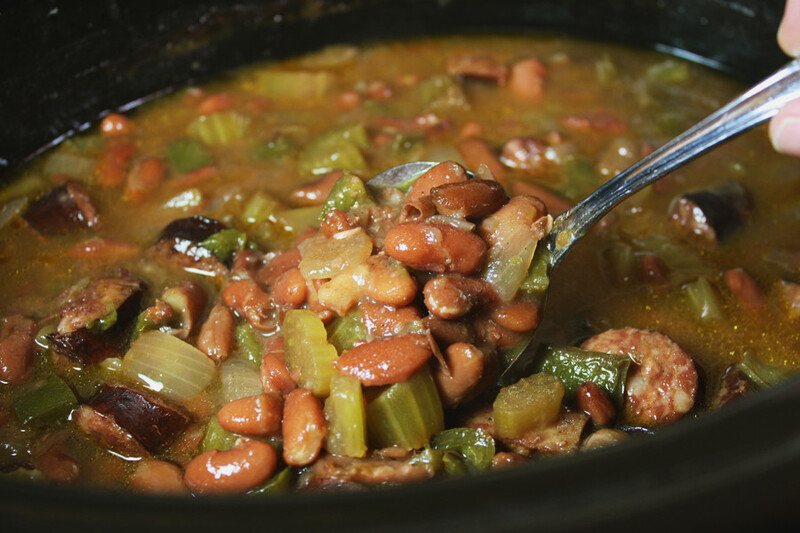 Perfect to leave in the crockpot while you go out sledding and come back to a nice hearty meal. Thank you Hil! I will definitely drop by your link party! Think this will be in my crockpot tomorrow! Or today if I can get those beans in a quick soak. This sounds perfect for a cold winter dinner. Putting it in my tailwind queue right now! 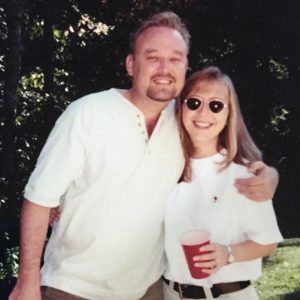 My husband makes red beans and rice, but I have to say your recipe looks way better! I’ll have to share your recipe with him 🙂 Thank you for sharing with us at Snickerdoodle Sunday! Pinned and tweeted. I always am looking for great crock pot recipes and this looks like a winner. I like the fact that it is amde with sauage – sounds good. Saving for later. Thanks for sharing. Oh this looks so good! Stopping over from Show & Tell! 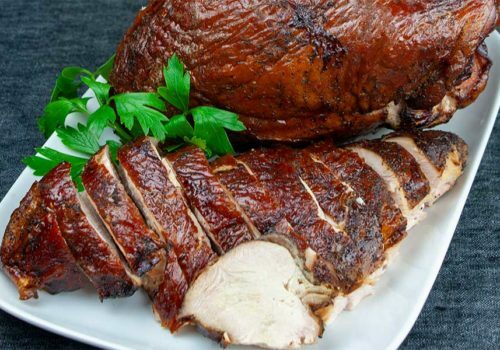 This looks like a hearty winter meal, and I can make it in the crock pot! Thank you for sharing! Yum! This looks great! We love rice and beans. I’m going to have to try this one! Thank you for dropping by, Melanie! My husband loves red beans & rice. And I love my slow cooker. A great combination! Visiting today from While I’m waiting. Have great day! That sounds like a win win situation, Donna! Thank you for stopping by! This looks and sounds delicious. I might try similar soon but with normal sausage. My family is going to love you for this! 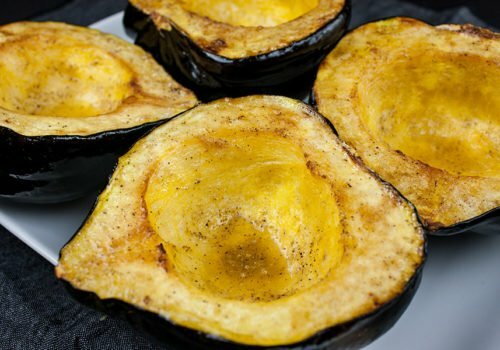 This is a favorite and the crock pot will make it easier! Thanks for sharing with the Thursday Blog Hop! I hope they enjoy it as much as we do! Thank you for dropping by Pam! 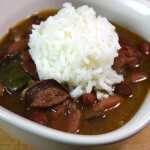 I’m a big fan of red beans and rice, this looks so good, great idea to use the slow cooker! Thanks for sharing at What’d You Do This Weekend?! 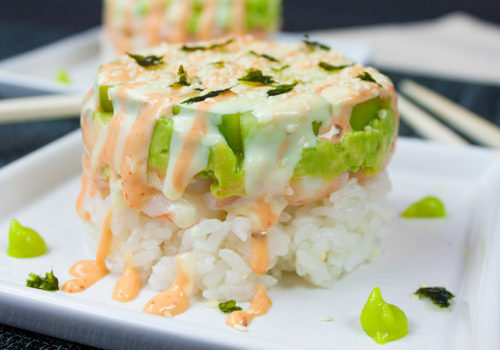 This looks really yummy! Love slow cooker meals. Nice to have it all ready at the end of the day. Thanks for sharing with SYC. I love a slow cooker recipe, especially something like this which is tasty, hearty and looks warming. Perfect for the winter. I would definitely like to try this. Looks delicious I love ultimate comfort meal thanks for sharing with Hearth and soul blog hop. Pinning and tweeting. 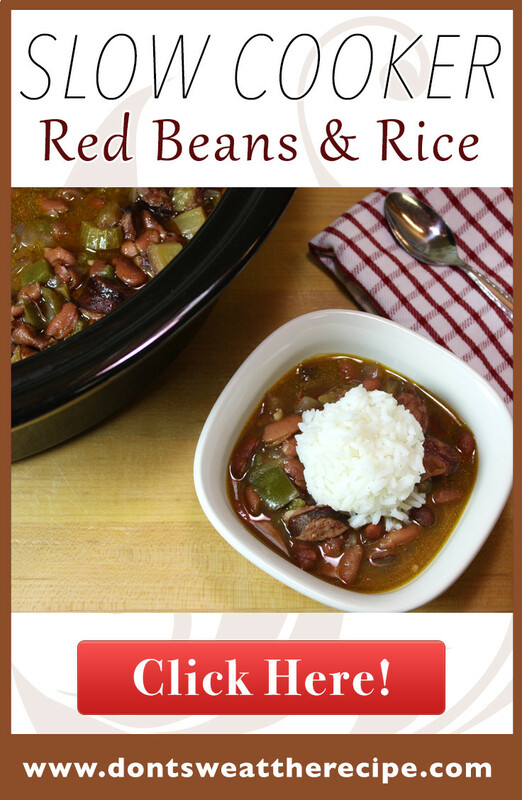 We love Red Beans and Rice your recipe looks awesome! Hope you are having a great day and thanks so much for sharing with Full Plate Thursday.